Major S Bashyam was born in Madras (now Chennai) on 2 September 1932. The elder son of Sri S. Alavandar and Smt Ramathilakam, Maj Bashyam was spirited and active even as a little lad. After finishing his schooling, he joined the well known Presidency College in Madras. He obtained his bachelor’s degree in Zoology from the University of Madras with Botany and Military Science as ancillaries. The foundation of his military life was laid in college, while being in the National Cadet Corps (NCC) for four years, where he rose to the level of Under Officer. Maj Bashyam had always been fascinated by the armed forces since his childhood. 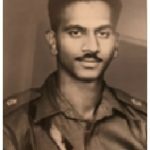 So, although he enrolled for a master’s degree in Political Science, he knew that his true calling laid in serving in the Indian Army. He pursued his dream and got selected to join the Military College (now Indian Military Academy) in Dehradun . He was commissioned on 3 June 1956 into 9 Punjab of the Punjab Regiment, a Regiment known for its courageous soldiers and various battle exploits. After serving in different operational areas, Major Bashyam joined his battalion in the North-East Frontier Agency(NEFA), the present day Arunachal Pradesh in August 1962. His unit, 9 Punjab was part of 7 Infantry Brigade deployed in Kameng sector of NEFA, under the command of Brigadier Dalvi. By the summer of 1962, tensions between India and China had escalated. After consolidating its position in Tibet, China laid claim over large parts of Indian territory in NEFA and Ladakh. To enforce these claims, China established military posts all along the Indo-China border. When India started taking measures to stop these intrusions a clash followed in October 1962. China had been preparing for the confrontation with India for few years and had built roads, constructed airfields and had organised Tibet into a military hub. The Chinese invasion in Oct 1962 came along three directions- Thag La and Walong in NEFA and Chushul in Ladakh. In September and early October, skirmishes with Chinese forces took place in Namkha Chu valley, south of Thag La ridge. The two battalions, 2 Rajput and 1/9 GR of the 7 Infantry Brigade fought a grim battle in this area. The soldiers of these battalions fought valiantly but the numerically superior Chinese forces finally had their way. The other two battalions, 9 Punjab and 4 Grenadiers were pulled back as their rear became exposed owing to enemy infiltration. Subsequently the 7 Infantry Brigade, led by 9 Punjab, marched on foot to take up defensive positions on the banks of the Namka Chu river. On 21 October, China launched a major offensive in Division strength in Kameng sector in Namkha Chu valley. The next two days saw all positions of 7 Brigade being subjected to relentless artillery barrage along with the infantry assault. Maj Bashyam’s unit faced the brunt of the attack but the troops fought with outstanding courage and resoluteness. Maj Bashyam was commanding one of the companies of 9 Punjab and led from the front in repulsing the sustained attacks. Maj Bashyam and his soldiers were no match to Chinese forces in terms of their numbers or quality of weaponry but they more than compensated for it with their sheer daredevilry and unyielding fighting spirit. However during the continued heavy exchange of fire, on 22 Oct, Maj Bashyam got hit by a grenade at around 1205 hours, as reported by an eye witness later. Maj Bashyam succumbed to his injuries and was martyred; though reported MIA(Missing in Action) initially, he was later confirmed KIA(Killed in Action). 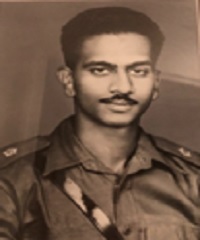 During this operation, Maj Bashyam along with with gallant men fought against overwhelming odds — high altitude, hostile terrain, bitter cold, lack of proper equipment and ammunition, and meager rations. Maj Bashyam was a committed soldier and a gritty officer who laid down his life in the service of the nation following highest traditions of the Indian Army. 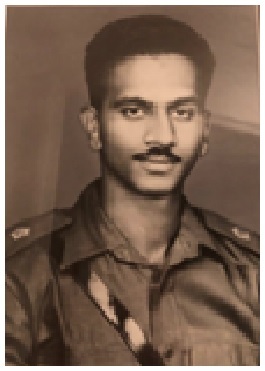 Major S Bashyam is survived by his wife, Varalakshmi (then 23 years), and daughters, Vaishnavi, and Vaidehi (then 2 years and 11 months respectively). His sacrifice for the Nation – sheer Courage- should be An example for all us citizens. You are a hero, may your soul rest in peace. Sacrifice made you immortal.